“Paperwounds,” is an intimate look into the sometimes-surreal, often-manic realm of the suicidal and depressed. It is an intense snapshot of the numerous facets that go into the decision of taking one’s own life, each of its disparate parts aligning to form a piecemeal narrative readers may only ever really guess at in its entirety. 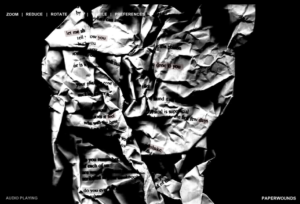 Presented as a crumpled up piece of paper, readers “unwrap” the suicide note by clicking on the highlighted/pulsating words within its folds. Doing so exhumes other, shorter notes the writer placed within the virtual letter, each one a different illustration of–perhaps–what drove the fictional victim to this ultimate negation of self. The interface, technological sounds, and brief animations when you mouse over certain texts combined with the ruined state of the materials create a forensic tone for the work, casting the reader in the role of an investigator. The poem may be zoomed in on, zoomed out from, flipped, rotated, dimmed, and made completely invisible–though doing any of the aforementioned does not seem to change the nature of the text at first glance. While perusing the poem, one gets a sense of a much larger tale going on in the background of what is being read. Though each fragment of the “note” seems disconnected from the next, perhaps this is the actual point of the narrative therein–there are never any “right” answers when it comes to untreated depression and suicidal tendencies, so the supposed chaos of each fragment may be purposeful insofar as no one truly knows what event may have set the fictionalized victim off. The background music of the work, too, works in its favor; as occluding and stripped bare as it is, it makes reading the work seem slightly distressing, as if one should not be laying eyes on this most private of moments.